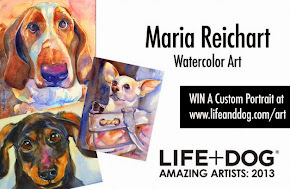 Maria's Watercolor: Featured Artist at Life + Dog Magazine! 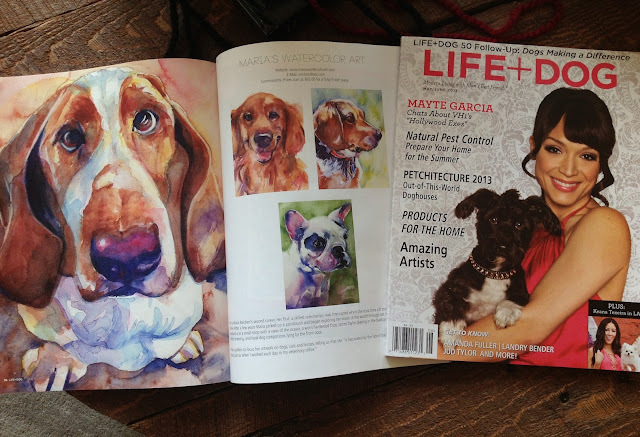 Featured Artist at Life + Dog Magazine! Had a fellow artist send me information about a magazine looking to feature artists that focus on painting dogs. So... I sent an email with info about my artwork and links to my blog. So happy and honored to be one of the artists chosen. A wonderful magazine with wonderful photos, they sent me a box of the current issue and am delighted to see my paintings on a two page spread! Thank you to Yevgenia Watts (of Watercolored Hands) for sending me the info and thinking of me and thank you to Life + Dog Magazine for choosing my work, the lovely feature and for sending me the box of magazines! Thanks Diana, very exciting, not sure about deserving it, but am so honored, and seemed to have made some really nice friends on line. It was so nice of Yevgenia to forward me the information. I am very lucky I think :) Enjoy the weekend, hope it is warmer by you then here. I Have a lab to paint today but a black one, not yellow! That is so cool, Maria! Congradulations!!! Thank you Pat! That is a big complement from a dog lover and painter like you! Much appreciated. This is wonderful and well-deserved!! Congratulations Maria! Congratulations, Maria! You'll have to send those out to family and friends! Thank you! I am glad you reminded me, I promised to send one to my sister out east, I will do that today. And one for the owners of the featured dogs too! how wonderful! Well done - you should send some horse painting pics to a horsey magazine next! Thank you so much Sharon! You know I do love to paint the horses :) I admire your work so much, especially your wildlife paintings and pet painting, so beautiful.